The small island of Tioman enchants visitors with its glorious beaches and lush rainforests. The largest of a group of 64 volcanic islands, legend has it that Tioman is the final resting place of a fabled dragon princess who stopped to rest for a while, when flying from China to Singapore, and so enchanted was she with the beauty of the area she decided to stay and took the form of the island. Much of the 44 square miles of this alluring paradise are covered with misty mountains, tropical rainforest and lush greenery, with the main beaches fringing the western coast. 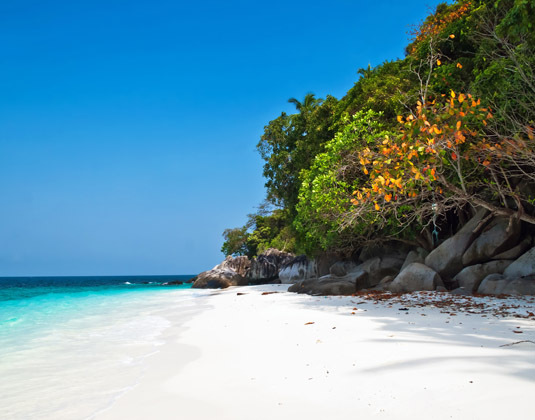 Soft stretches of inviting sands provide an idyllic spot for leisurely days under the sun, while the warm equatorial waters are just perfect for splashing around in. Snorkelling and diving is a must as the underwater world is quite simply mesmerising. Tioman Marine Park occupies an area of two nautical miles and its crystal clear waters highlight the undersea garden of coral reefs, aquatic plants and vibrantly coloured fish. If you prefer not to explore below the waves, take a tour on a glass bottom boat to catch a glimpse of the vivid coral and tropical marine life. Explore the majestic rainforest by following one of the jungle trails, such as the easy hike from the southern edge of the Berjaya Resort in Tekek to Kampung Paya. Juara Bay has trails that lead to scenic viewpoints and towering waterfalls, while the magnificent Asah Waterfall can be visited by following the trail from Mukut. Hear the call of exotic birds as you hike this largely untouched interior whilst keeping your camera close at hand in the hope of glimpsing wildlife such as monitor lizards or monkeys. Kampong Tekek is the island's largest village and where you'll find a row of food stalls and convenience stores beside the jetty. If you prefer to dine and drink away from the hotel there are a small selection of bars and restaurants in Tekek and the village of Salang. Call and speak to one of our travel experts who have experienced Tioman Island personally. There are no direct flights from the UK to Tioman Islands. Travel by road from Kuala Lumpur (4 hours 30 minutes) to Mersing jetty for a ferry transfer to Tioman (1 hour 30 minutes) and then five minutes by road to the hotel. 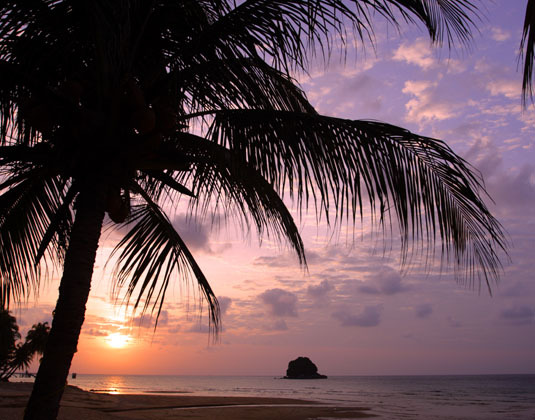 Like mainland Malaysia, Tioman has a hot and humid climate, with sunny afternoons and warm evenings but cool nights. The best time to visit is between March and October as from November to January, when the monsoon occurs, the whole island winds down dramatically and many places close.